Golfing in Ireland. Photo: Robert Schroeder. Five days of golf in Ireland’s southwest and a day of football in Dublin. 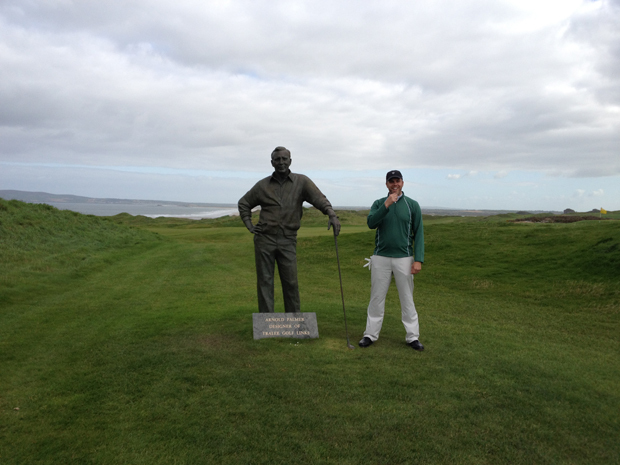 I credit my brother-in-law Tom Coyne for inspiring my golf trip to Ireland. Not too long ago, Tom completed what can only be called THE ultimate Irish golf trip – a whole summer circumnavigating the entire country, on foot, with his clubs on his back, playing the legendary links courses as one continuous round of the best golf Ireland has to offer. Tom’s epic journey has been captured for posterity in his best-selling book, A Course Called Ireland. For my own great Irish golf trip, I took a slightly different approach – I wouldn’t be alone, it would not be nearly as long and I’d have a few more creature comforts. 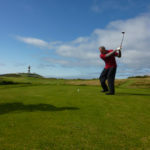 I was travelling with my father-in-law and a couple friends and we put our trust in the experience and expertise of Celtic Golf, specialists in golf vacations to Ireland. Its owner, Jerry Quinlan, has been bringing American golfers across the pond for the thrill of Irish golf for more than 25 years. Our 6-day trip was centered in Killarney with accommodations at the beautiful 5-star Killarney Park Hotel. 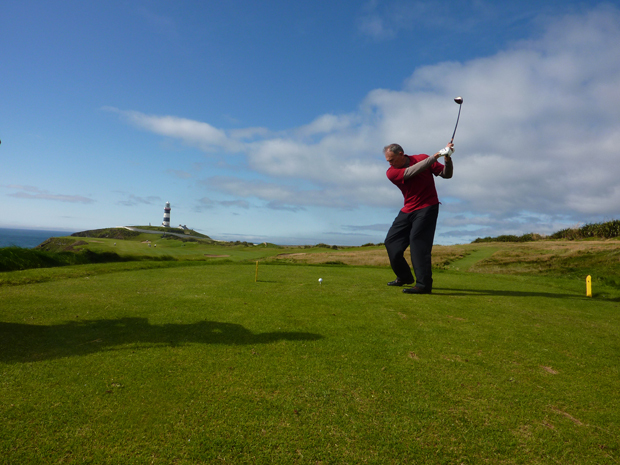 Each day we set out for a different course, beginning with the Killarney Golf and Fishing Club, followed by Waterville, Tralee, Ballybunion and finally, Old Head. 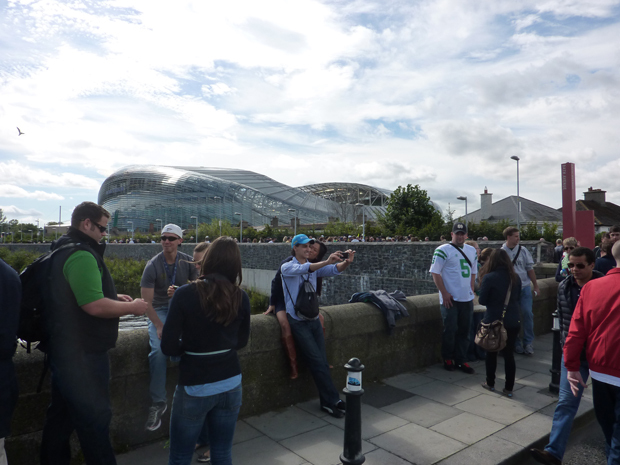 As if golf wasn’t enough, the trip also included a day trip to Dublin for the Emerald Isle Classic, an American football game featuring Notre Dame vs. Navy. Well, at least it felt that way. Our flight was a sleepless redeye to Shannon. After we finally arrived at the Killarney Park Hotel, we had only enough time to change clothes before heading to our morning tee time at The Killarney Golf and Fishing Club’s Killeen Course. The Killeen Course hosted the Irish Open in 2010 and 2011. It was the only parkland course we played on the trip. And like all the courses we experienced, this one delivered with amazing scenery and a challenging layout. A large lake was visible from just about every hole, and beyond it in the distance, majestic mountains were bathed in patches of sunlight and passing rain clouds. Sleep? Who needs sleep? The hole I will remember most is the par 3 No. 10 with its green that seemed to float on the lake. A fierce Irish wind was blowing straight at me and it blew my 6 iron shot just short and into the water. This must happen to many unsuspecting golfers – right under a tree beside the green, there was a kind gentleman in high boots holding a water retriever. I didn’t notice him until he had already fished my ball from the water. He placed my wet ball onto the fringe of the green and at first I thought my ball had made it after all! 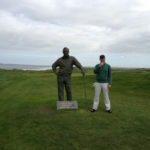 This was my first-ever Irish links experience and for the first 6 holes at Waterville, it literally was water-ville. It was stormy and the fierce sea winds made the rain feel like hail or sleet upon our faces. These were the toughest conditions I had ever played golf in. And you know what? I absolutely loved it. It was the perfect storm to put my rain gear and golf game to the test. I learned at Waterville that the ground on an Irish links course is composed of earth and sand. This makes the playing surface firm, yet porous. Water doesn’t form puddles like it would in The States. When the rain slowed and stopped, the water was filtered away. Brilliant! If I were home I wouldn’t have played at all in such conditions. Instead, it was game on! My most memorable hole was No. 12. The par 3 “Mass Hole.” On this hole you have to play your ball over a deep hollow surrounded by high dunes. This hollow is where secret masses took place in the 18th century. Back then, the celebration of mass was punishable by death in Ireland. An errant golf shot, thankfully, is only punishable by a stroke or two. Our prayers were answered when my father-in-law and I both scored par. 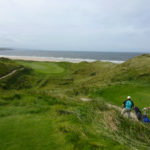 Arnold Palmer famously said about Tralee, “I may have designed the first nine, but surely God designed the back nine.” Tralee features views of the Atlantic Ocean from virtually every hole. On the front nine, we watched the tide come in by a 14th century castle tower that guards the third green. On the back 9, our jaws dropped in admiration of God’s handiwork. The highlights were holes 12 and 13. The approach shot on 12 was over a canyon and this was right before you had to hit over another canyon on 13. Those two back-to-back holes left you with the feeling that you were someplace special. My absolute favorite hole at Tralee was No. 18 – not for its beauty or splendor, but because I had a perfect chance at eagle for the first time in my short golf career. I didn’t make the eagle putt, but I was left with an easy birdie. A 2-putt birdie was the perfect ending to a great day. That was what my father-in-law and I were saying about our rounds at The Old Course at Ballybunion. The first hole features a graveyard to the right. Let’s call it an omen of what’s to come for your golf ball, and your scorecard if you aren’t careful. 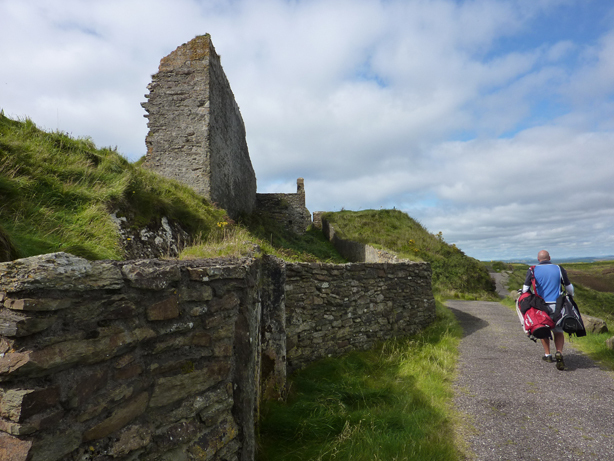 Ballybunion is among my brother-in-law Tom’s favorite courses in Ireland. And now I can see why. The Old Course was the most challenging I had ever played and probably ever will play. 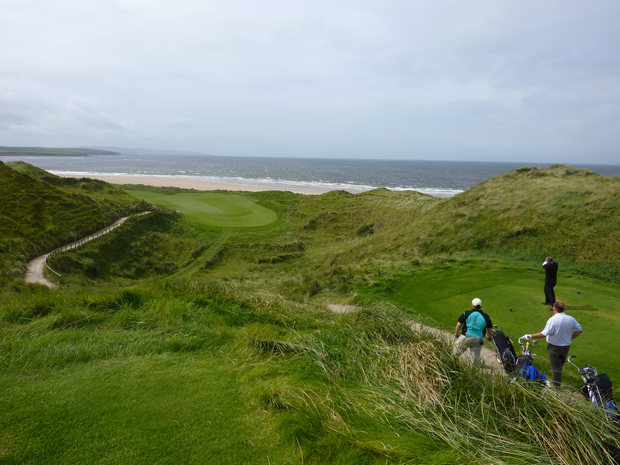 As with every links course in Ireland, the fairways at Ballybunion are book-ended by monstrous hairy green mounds that simply devour golf balls. 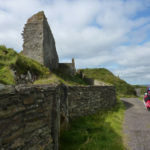 What’s different about Ballybunion is that it seemed to snake around much more. You find yourself playing balls up and down its twists and turns like a wild green ride at a theme park. The bus back to the hotel was quiet with sleeping golfers. We all survived. “Are you going to the match?” Many locals asked me that question during my stay in Ireland. My answer was “yes!” I was going to see the Fighting Irish take on Navy in Dublin. The “match” was a pilgrimage. In what can be regarded as the largest peacetime invasion of Ireland, 35,000+ Americans made the trip across the pond to take in the game. During both my flight and my entire stay, I saw more Americans decked out in Notre Dame and/or Navy regalia than I would if I stayed at home. The game brought the highest number of tourists to Ireland since they hosted the Ryder Cup at County Kildare’s the K Club in 2006. The Irish were grateful for the influx of an estimated 70 million Euro to help bolster the struggling economy. And what a welcome it was. 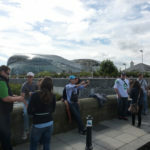 Aviva Stadium is a beautiful, state-of-the-art venue and the weather and atmosphere were like golfing in Ireland, it wasn’t about the score of the game. It was about the experience. For many Americans it was about a return to their ancestral home to celebrate and share culture. As if to honor us for surviving all that Irish links had to offer, the sky cleared, the winds subsided and the sun beamed for us all day long at Old Head in Kinsale, Co. Cork. It was a truly epic day. It was the perfect crescendo to a fantastic week of golf and football in Ireland. In a word, Old Head is special. It literally puts the game on a pedestal. The entire course sits atop 300 ft. cliffs that form a 2-mile promontory into the Atlantic. Only a small land bridge connects this golf sanctuary to the rest of the world. The par 5 No. 12 was the toughest hole. Its fairway narrowed to a green surrounded by steep, grass-covered, ball-hungry mounds on the right and a giant seaside cliff on the left. There was no room for error. I put my approach shot into those hungry hills. Just 4 more feet to the left and I would have been sitting pretty! But, that’s how it goes. After spending time digging in the tall grass searching for my ball, I was left with an awkward chip to the green and escaped the hole with a hard fought double bogey. I heard someone say if golf in heaven isn’t like Old Head, then I don’t want to go there. I have to agree. Hands down, there cannot be a more dreamy setting for the game than Old Head. and challenged my golf game like never before. The sights were unlike anything I have ever experienced and I cannot wait to return for more! love his book. a course called Ireland. 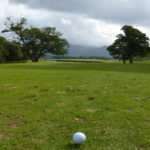 Golf on the Emerald Island is an incredible feeling, I think everyone should play there, but first you should buy golf gloves to make your game level higher.